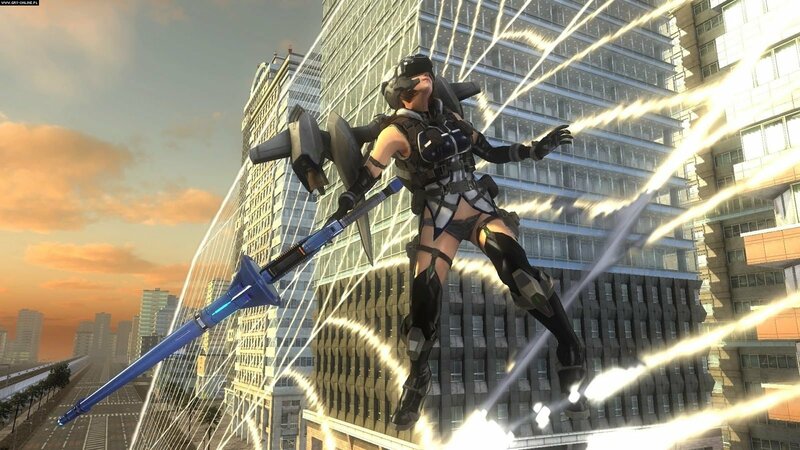 Earth Defence Force 5 (EDF 5) is spectacular. As a lifelong fan of the humour, entertainment value, and aesthetic of B-grade science fiction and horror from the glory days of the cinema, I have always loved how the EDF series has tapped into that, providing ridiculous action, hilariously bad voice acting, and completely balls-to-the-wall plots. 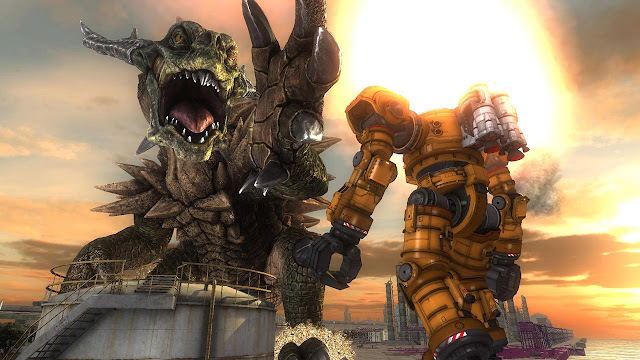 The series has also played in a way that matches its B-grade theme, and that's typically been the series' Achilles heel, but here's the big secret about EDF 5... it's not just pure B-grade entertainment. It's also a genuinely good game. What's most impressive about EDF 5 is the sense of scale it offers. When a giant, city-sized flying saucer appears overhead, it looks like something of a size and power that makes the Independence Day alien ships look amateur by comparison. When you launch yourself into a horde of ants and start blasting away, the way their bodies slowly fall to pieces from the bullet storm is not only visually spectacular in how grisly it is, when all you can see is the movement of giant ants all around you, but it's also viscerally entertaining. It's also almost intimidating how much there is in this game. Levels are short and over after just a few minutes, but there is something like 110 of them, and the game is still introducing new enemies and making sure the game remains fresh right to the end of that list. It's not that long because of padding. It's that long because the developers really did have that much to share. Throw in an excellent loot system, which is constantly throwing new and spectacular toys at you to play with, some truly impressive environments to fight over (endlessly repetitive city environments are a thing of this series' past), and brilliant visual fireworks, and for the first time EDF's campy narrative and dialogue comes across as something deliberately B-grade, rather than the result of budgetary constraints. Indeed, the way the other characters natter on and say the most ridiculously over-the-top things had me close to tears of laughter. For example, the first time that you come across the giant frog-like aliens, your earpiece radio fills with your squad talking about how the look "just like humans." They're 10-feet tall giant frogs. I mean, sure they walk around on two legs, but the absolute wonder that all your allies have about how "humanlike" these aliens are made me wonder if humanity was really worth saving at all. Online is an absolute treat, too. 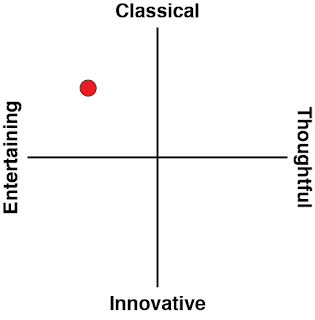 I was testing it out with another critic working on his review, and there were no dropouts, bugs, or weird moments that shouldn't have happened. 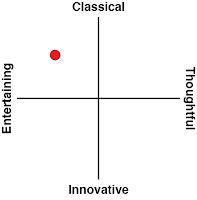 This is the kind of game that is a lot of fun to laugh along with other people while playing, and because there are four different character classes to choose between, it's actually possible to get a really good multiplayer party together. EDF5 supports up to four players, and with player having their on speciality and then tackling the (very difficult) highest difficulty setting together, EDF 5 is one of the most appealing (and surprisingly tactical) multiplayer games I've ever played. The only thing that lets the presentation and experience down, albeit just a little, is the frame rate. 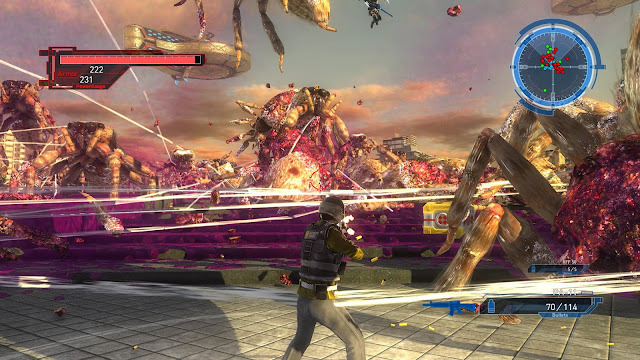 Because the action has such a sense of scale, and there's more on-screen activity than even your typical Dynasty Warriors number, EDF 5 does suffer from slowdown, even on PlayStation 4 Pro. Never enough to reduce the game to the point that it's unplayable, but it's noticeable. "No, you hold on. First was your firecracker, a harmless explosive. Then your hand grenade: you began to kill your own people, a few at a time. Then the bomb. Then a larger bomb: many people are killed at one time. Then your scientists stumbled upon the atom bomb, split the atom. Then the hydrogen bomb, where you actually explode the air itself. Now you can arrange the total destruction of the entire universe served by our sun: The only explosion left is the Solaranite." It's a laboured bit of writing, and that film is simply terrible, but the underlying principle and point is a important one to make, especially in the context of the time Wood wrote it. The ever-escalating power of weapons poses an existential threat to us, and humans as a collective seem to be incapable of recognising that. Wood's film, terrible as it is, came from a meaningful place in trying to highlight that. Or, for another example, consider George R Romero's zombie horror films. The likes of Night of the Living Dead and Dawn of the Dead were either allegorical, or explicit criticisms of everything from power structures and racism, right through to criticism. Romero was certainly a more intelligent film maker than Wood, and his films were B-grade because of budgetary constraints, rather than any particular lack of creative talent on his part, but they again showed that while B-grade is entertaining and/or silly, it's not necessarily dumb. EDF 5's a bit like those. It borrows B-grade elements and aesthetics from science fiction and Japanese giant monster (Kaiju) films, but as the planet is slaughtered by the aliens, the propaganda broadcasts that play from time to time, reassuring people that the EDF is turning the war around, certainly raises questions. There's a scene where a commander tells your unit that they're hesitant to use nuclear bombs on the alien spaceships (which at the time seems to be the only way to destroy them), because that renders them "unsalvageable." This is moments after you find out that the alien invasion has killed 20 per cent of the human population. Without giving away spoilers, the game's end boss certainly packs a thematic punch, too. EDF 5 might be B-grade, and it absolutely relishes that it's a homage to those films of yesteryear, but it's anything but dumb. 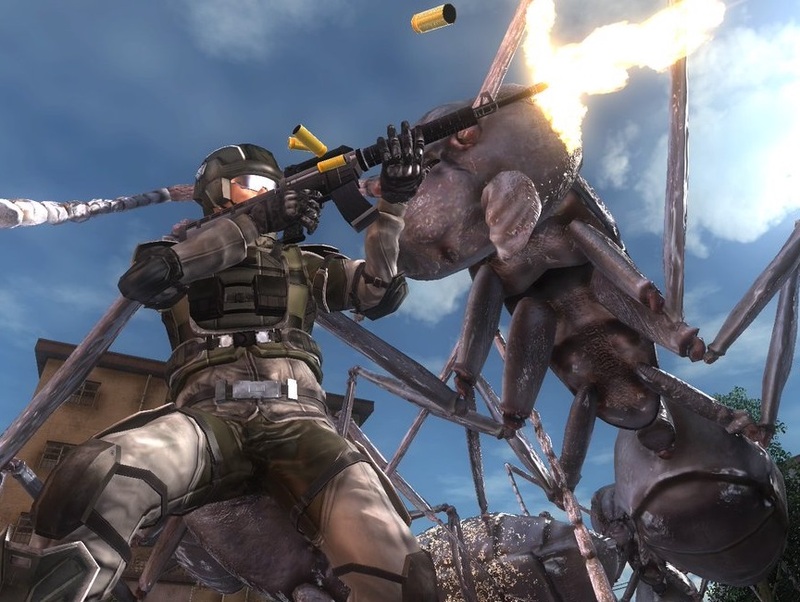 To use one more quote - this time from Starship Troopers, a film that Earth Defence Force 5 is heavily reminiscent of in its action: "Violence, naked force, has settled more issues in history than has any other factor, and the contrary opinion is wishful thinking at its worst. Breeds that forget this basic truth have always paid for it with their lives and their freedoms.” EDF 5 too is incredibly violent. That's a big part of its appeal and a big part of its message. As a game, EDF 5 is such a massive leap from the previous title in the series, in every way, that it feels like it belongs in a different series entirely. And yet, for all its nonsense, giant monsters, and ever-escalating explosions, there's also a sense that this EDF, moreso than its predecessors, has also remembered that something can be B-grade, and still convey some kind of message of worth.